The University of the West of Scotland (UWS) has a rich and diverse history inherited from the various institutions that preceded it, including the Paisley School of Art (1836 - 1897), University of Paisley, Bell College of Technology, Craigie College of Education and Dumfries and Galloway College of Nursing. In 2007, the University of Paisley merged with Bell College, and the Privy Council approved the merged institution named the University of the West of Scotland (UWS). Today, UWS has four campuses, in Paisley, Lanarkshire, Dumfries, and London, with over 17,000 students. UWS is one of the UK’s most innovative modern universities and is ranked by the Times Higher Education in their 2018 World University Rankings as being in the top 3% of universities worldwide, and feature in the top 200 of their Young University World Rankings. The Times/The Sunday Times Good University Guide 2018 ranks UWS as a top 100 UK university and as the highest in Scotland for both teaching quality and student experience. 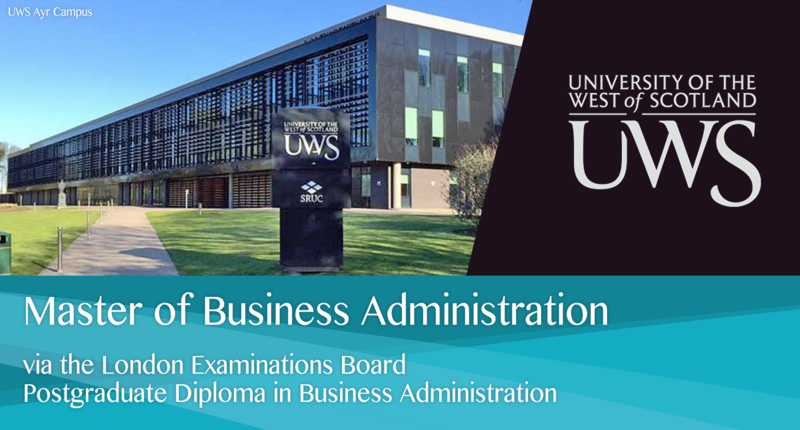 The MBA qualification from the University of the West of Scotland is widely recognised by employers and universities worldwide. Affordable tuition fee and flexible study mode. No examination required. The programme is tailor made for the mature and working students. Access to the UWS MBA Online E-Library. UWS approved local supervisors to guide students during the Strategic Business Project.